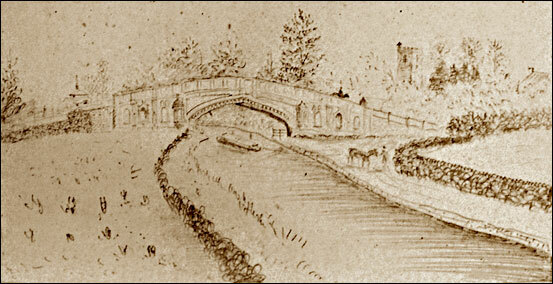 The bridge, number 65, variously called the Ornamental Bridge, Samson’s Bridge and Solman’s Bridge, was constructed to carry a road (Bridge Road) for livestock and road traffic from the crossroads across the new canal to the Priory, and turning right, down to rejoin Main Street where it started again east of the canal. We do know that John Soanes an eminent architect, designed for local landowners including the Mansels, and Soanes was involved in designing and building Tyringham House for Mr Praed who was Chairman of the Grand Junction Canal Committee. 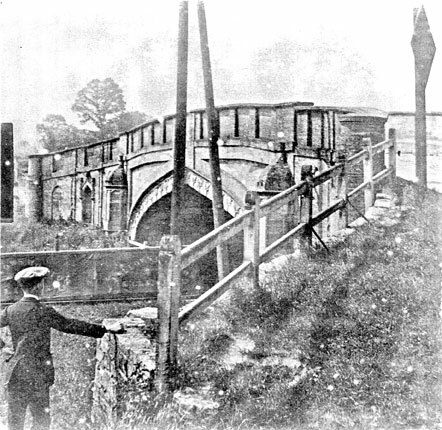 We have yet to find documentary evidence of any connection with the Bridge at Cosgrove, but it seems a possibility. Although Colonel Solmans is yet to be traced, George Biggin is described in our Cosgrove Characters section and from this his eccentricity and imagination can certainly be confirmed! 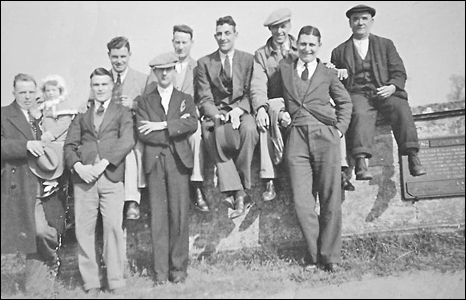 Who are these chaps enjoying themselves on the bridge - and what did the plaque on the right say? 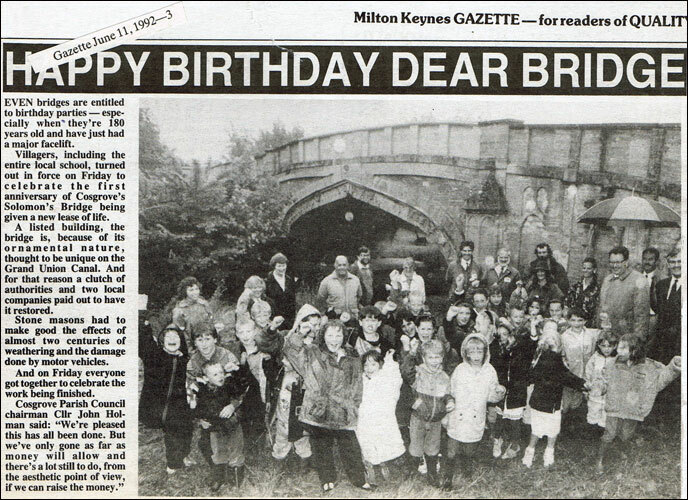 In February 1996 the Parish Clerk explained the controversy over the name of the Bridge in the local newsletter “The Old Mail”. 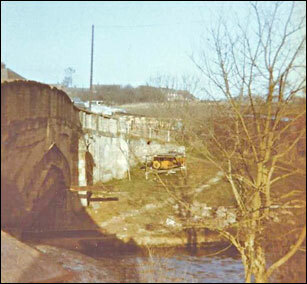 After the M1 was finished and most of the gravel lorries had left Cosgrove, the old bridge was sadly in need of repair. In 1973/4, a programme of strengthening and rebuilding was carried out. The old bridge from the Sawpits field – the back of Manor Close in the distance. The land was prepared on either side. This picture looks from the east side of the canal across towards Bridge House. Scaffolding supports the old Bridge and the Bailey bridge can be seen on the left. 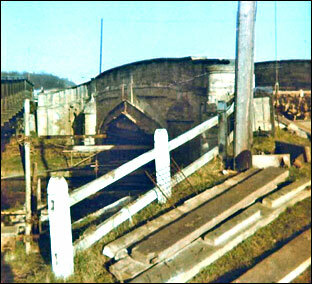 A Bailey bridge was thrown across the canal on the south side of the Bridge, from Bridge View garden to the plot where 46 Bridge Road now stands. This took all the traffic through Cosgrove while the old Bridge was being rebuilt. 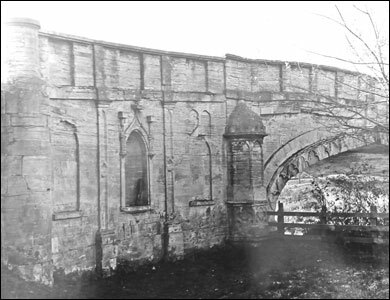 The old Bridge was supported by scaffolding and its stone was stripped back until only the skeleton of the arch remained. 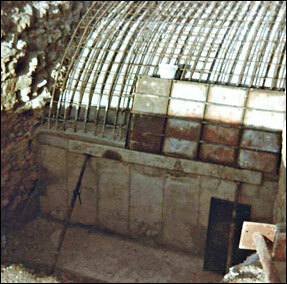 The walls of the arch were underpinned on each side and concrete poured around to support it. The stones were repaired and refaced and gradually replaced exactly where they belonged. Finally the roadway across the Bridge was resurfaced and the Bailey Bridge could be removed. George Biggin Esq., whose residence, Cosgrove Priory, is in sight of the bridge. The proximity may explain the bridge's unusually ornamental appearance. This text is a legacy record and has not been updated since the building was originally listed. Details of the building may have changed in the intervening time. You should not rely on this listing as an accurate description of the building. The Bridge has survived dreadful ill treatment, including carrying over 50 gravel lorries a day for months during the extraction of sand and gravel from the Cosgrove Park area for the construction of the M1 motorway, and almost annual assaults from wide loads. Its sandstone carving suffers erosion and weathering all the time, but it is perhaps the best loved symbol of Cosgrove to this day. 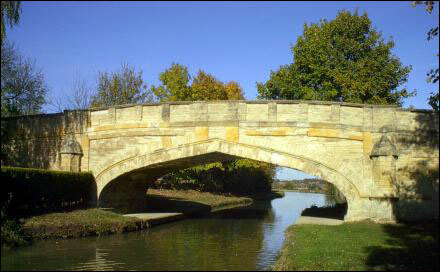 Cosgrove Bridge is made of sandstone in parts  in the spring birds start to peck at holes in the stone to help with their digestion, to get nutritional minerals and to find mites and insects in the crevices. When it is quiet, squirrels come up from the Priory Lane, where there were several massive elm trees in the 70s before Dutch Elm disease. Instead of crossing the Bridge by the road, the squirrels jump up onto the parapet and run along the top to the gardens on the west side to plunder bird tables. Visiting boaters always slow down to take pictures as they go through the Bridge, and art and photography students come to use it as a backdrop. Wedding parties sometimes gather in front of the Bridge for photos, and children climb up into the niches to scare their parents. There are often people looking bewildered under the Bridge when they don’t realise the towpath runs out and continues on the other bank. The Grand Union Canal Race, the longest foot race in Britain, passes over the Bridge in late May. It marks the halfway point of a race of 104 miles from Birmingham to the London Basin. The three legged symbol on the plaque is a benchmark for a triangulation point identifiable under the national system  these are disappearing from the UK as GPS mapping takes over. There is another of these benchmarks, without a plaque, on the northwest corner of the Church, where it is often mistaken for a mason’s mark. 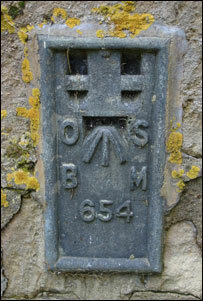 Hikers now use the old trig points as spotter’s marks for long distance walking across the UK using internet sites to “bag” plaques  like trainspotting.